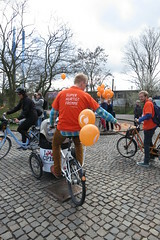 Last week, on April 14, 2012, the first stretch of Copenhagen's new and long-awaited Bicycle Superhighway network opened and Copenhagenize was there for the bike ride. It was back in 2009 that we first wrote about the plans for these bicycle superhighways. 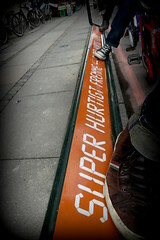 The boys at Trunk films made this cool film that includes the Superhigways project. The project has taken time to develop but now the routes are getting ready for use. In addition, when we first wrote about it, there were plans for 13 routes. That has now been increased to 26. 300 km of dedicated superhighway routes when the project is complete. The 17.5 km Albertslund Route is the first one to launch. The route runs through a number of municipalities, including Copenhagen, Frederiksberg, Albertslund and Rødovre. They are being called Bicycle Superhighways, but it's worth noting that the routes follow existing, separated bicycle infrastructure. There will be some improvements on certain sections and various facilities will be added. It has proved to be a logistical challenge getting so many municipalities to work together. Copenhagen is comprised of 550,000 people but the greater metro area is comprised of many different municipalities. Planning routes through them has taken longer than expected, but now the project is finally underway. I shudder at the thought of how many meetings were required and how many litres of crappy, municipal coffee were consumed. But I respect that sacrifice for the cause. 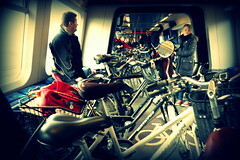 Me and the kids headed out to Albertslund on the local train, using the large bicycle compartments on board. 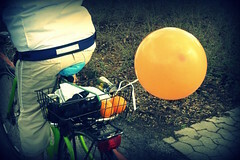 A lot of other people had the same idea.It was a bit crowded, but we all helped make the bicycles fit. Everyone gathered at the meeting point next to Albertslund Station and after the usual speeches by the usual type of politicians everyone started rolling towards Copenhagen. 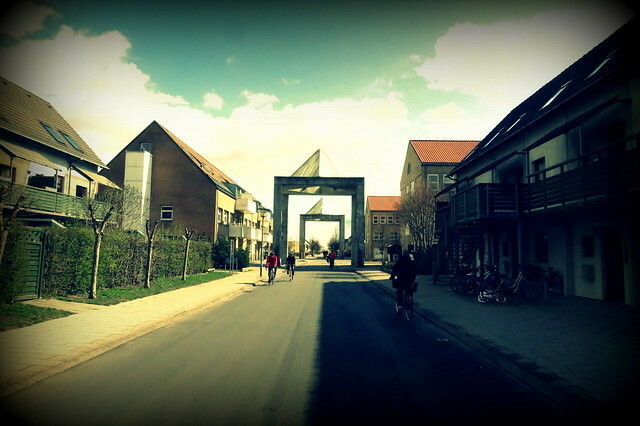 This area of Greater Copenhagen is a product of the late 60s and early 70s. 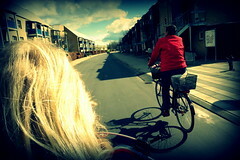 Back then planning for bicycles was integrated into the design of the areas. As a result, cycle tracks avoid main streets and there are many overpasses over the cycle infrastructure for cars, allowing safe routes to everywhere in the area. The superhighways follow these existing routes. Like this route through a housing development. Lovely, wide streets for bicycles. Pumps have been placed at intervals along the route, although there are also bike shops in the neighbourhoods along the way. We stopped at Damhus Lake for the official opening. 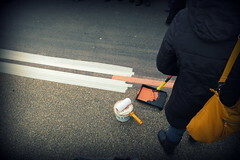 The entire route was marked with an orange stripe along the side of the cycle tracks and the last bit was painted in front of a media scrum. 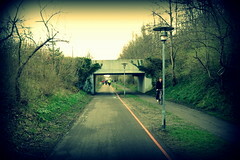 Cycle track (at left) and tunnel under a motorway (at right). There are some interesting projects related to the new routes being planned. Sensors under the cycle tracks that can register if there is a group of cyclists riding together. If so, the lights at the intersections will turn green in order to let them continue freely towards the city. Railings and footrests - first implemented in Copenhagen - are in place at intersections (at left). 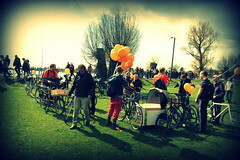 The Bicycle Office's cargo bikes were in action carrying juice and oranges for the participants (centre), but many people had their own refreshments - like the all-important beer (at right). 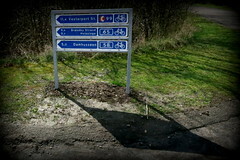 Signage has been updated to reflect the new routes. The Albertslund route is called C99. 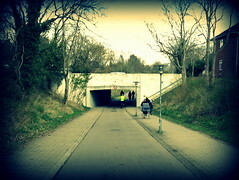 The C stands for the Danish name for the superhighways - Cykelsuperstier. So much for the Road Directorate assisting in new projects with an open-minded, progressive attitude. They are stuck in their antiquated mindset and stand in the way of innovation and progress. Traffic is merely a rubik's cube that has to be solved and not much more. 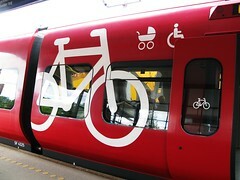 If we are to further expand our bicycle culture and infrastructure we need visionaries on board, not pencil pushers. The bike ride ended at Copenhagen's City Hall, in the gardens. 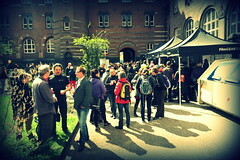 The traditional City Hall Crepes (Rådhuspandekager) were served. Although when we arrived at the head of the pelaton, there were a large group of cyclists already there. 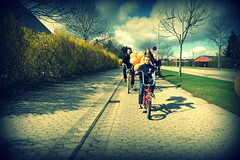 A group that had sped off ahead instead of riding with the rest of us. They were all over 55 - and resembed typical members of the Danish Cyclists Federation - and they had consumed most of the crepes 45 minutes before everyone else arrived. Which was rather regrettable for those of us with children - we'd been hyping up the crepes with chocolate and cream the whole way into town. 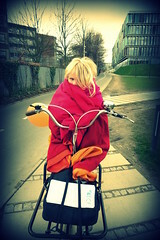 My Lulu got chilly after about 15 km so we just wrapped her up in a blanket on the bike. 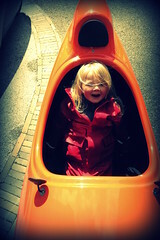 She soon forgot all about the chill when we got to City Hall and enjoyed playing around in a velomobile. 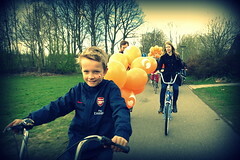 All in all it was a cosy event to celebrate the first bicycle superhighway. 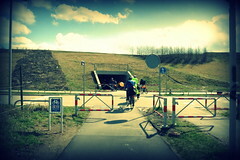 The Bicycle Office and Cykelsupersti Secretariat did a great job organising it. Here's looking forward the next 25 routes! 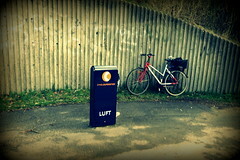 More information in English on the Cykelsupersti website.